Libraries. I always loved libraries, libraries and museums, obviously. I loved that Sammie loved them too, though her approach was very different to mine. Again, obviously. The first time we went to a library together it was her idea. Saturday morning and she announced that we were going to the library. I say ‘announced’ but what actually happened was that she screamed at the top of her voice from the shower that we had to go that very morning. In fact we had to go that instant. She wore thick black tights and black pumps, like a ballerina in negative. On top she wore one of my jumpers. A big thick navy cable sweater. For her it was like a dress; a provocative short dress. She wore long beads over the top, like a flapper from the twenties, and a beret, with her curly hair stuffed inside. She understood so well, that dressing was display, display of personality. She understood it both consciously and unconsciously. In the car I asked her what she liked to read. We had only been ‘seeing’ each other a week or two and I couldn’t believe we hadn’t discussed books, although she had made a point of perusing my book shelves that first night when she came to my house. Later she had told me that you could judge someone by the books they had, or didn’t have. In the same way you can judge someone by their choice of shoes. “Shoes are so often the windows to the soul,” she had said. Males who are sloppy in their shoe selection would be judged as sloppy people. Females who chose the wrong heel gave the wrong impression to men they wanted to attract. It became a game with us; imagining the lives of strangers by their shoes. “That man at the bar is obviously a spy,” she said, one night in the pub, “counter intelligence, M.I.5. ; he has chosen to dress down to fit in with the ambience of the place, but his trainers are so expensive, so ‘de rigueur’ that he has over compensated!” I loved her games. She told me that she didn’t have a “favourite book or genre” and I left it at that as we drove into the library car park. Once into the library I was just moving by habit and heading for the history section, which is conveniently located next to the magazines. I like to choose a book or two and then grab a comfy chair and flick through a magazine I couldn’t be bothered to buy. She grabbed my arm as I was heading off. “A plan?” I said, confused. “We need a plan,” she said smiling. She took my hand and dragged me to the front desk. “Hello young man,” she said to the guy behind the counter. He was probably older than us but she called him young man anyway, probably because he looked a bit ‘hippy’. He had long hair and a Metallica tee shirt on. Trying to be younger than he was, and Sammie knew it. She read people so well, it was like second nature. “Hello,” he replied, sounding bored and not looking up. “Do you have a list, or map, or catalogue showing where all the different kinds of books are please?” she was smiling and leaning her head to one side like a child. Acting dumb as if she had never been in the library before. The man looked up and smirked at her feigned ignorance, but I could see he was taken in by her smile. It was obvious he fancied her and would succumb to her charm. “Would you please be a dear and show me?” she asked, brushing her fingers over his hand on the counter. Needless to say he did. Came round the counter and logged into the computer for her. “How many sections are there?” she asked. “How fascinating!” she said, turning and winking at me like a bank robber, then sending the man away with platitudes of gratitude. I chose 73, because that was the number of my house. She chose 22; the number of her house. Then we had to find the first book shelf in that section. And from there we had to get the seventh book along from the left in the middle shelf. She said that seven was a lucky number as it was, at that point, how many times we had slept together. I got a book on how to do crochet and macrame. Patterns for making ridiculous colourful ponchos, fashionable in the nineteen seventies. We met back at the magazines and she showed me her book; a biography of Winston Churchill. Of course the sensible part of me protested and argued that we should swap books. But she laughed at that and explained that we couldn’t return to the library until we had actually read our books. She said it would expand our minds. It was the only book I have ever read about crochet and it bored me to tears. We sat in bed together reading our books and telling each other about them. She was like the ‘auto-didact’ from Sartre’s novel ‘Nausea’. She figured if you read widely rather than restrict yourself, you would understand more. It became our regular library game, and she was right. I learnt all sorts of things I would never have known about. Including Jean Paul Sartre. Sammie was always making fun games out of the most ordinary of situations. Even on that day after the library. We sat and had dull watery coffee at an ‘antiques fair’ in a church hall. We were walking past and she just announced that we had to buy something for each other there. We only had the coffee because she liked the old lady who served it. Well more accurately she liked the old lady’s hat, and tried to buy it from her. I wondered out loud to her whether calling it an ‘antiques fair’ was a misnomer; against the trades descriptions act or something. Most of the junk there was worthless and over priced and not exactly ‘antique’; just stuff people didn’t want anymore and donated to the church. She, of course, would have none of it. “Well yes…yes but it still works!” I said. Again she was right; she had a way of opening my eyes and making me see the world through a different lens. We bought tat and tried on third hand musty clothes and laughed, holding hands as we perused the stalls. I still have the silver pocket watch I bought that day. I keep it in my pocket, though it has never worked. I don’t know why I keep it. I guess sentiment is all I have now. Next > The Future anyone? I love that photo. 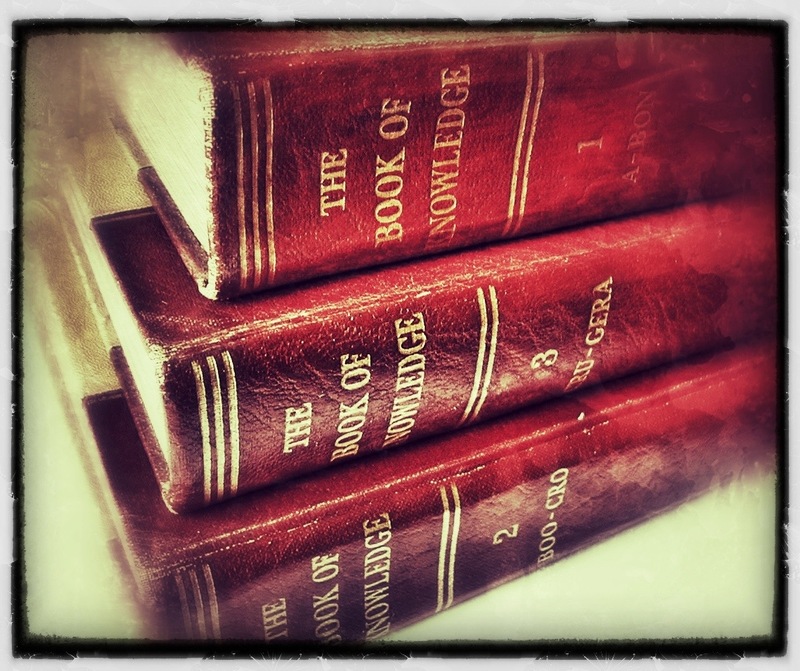 Don’t we all want a Book of Knowledge in our personal Library? BTW, I like the first title better. Shorter and to the point. Anything else should be a sub-title. Congrats on finishing NaNoWriMo, you did better than I did this year. 🙂 Only got to 38K words.